In an effort to rid himself of the Turtles, The Shredder with the help of Rocksteady and Bebop kidnap Obento, caretaker of the Far East Animal Society, and blackmail Usagi Yojimbo into destroying the Turtles. Usagi refuses to take the lives of four in exchange for one because it is dishonorable. The Shredder challenges Usagi to a sword fight — if Usagi loses he must serve The Shredder. Naturally, the only way that The Shredder can win is if he cheats — which he does. 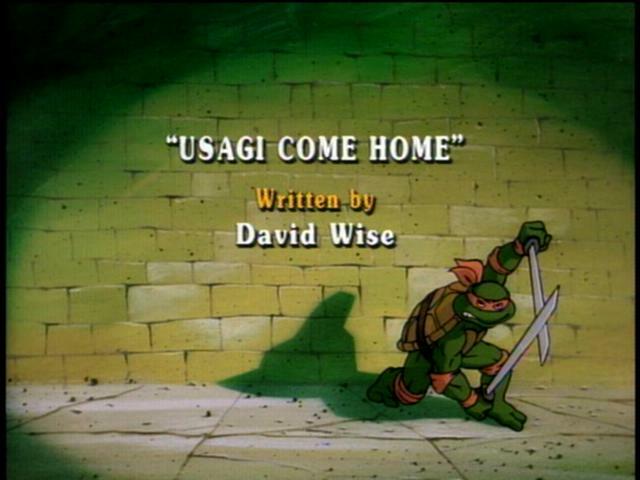 Usagi is honor bound and sets out after the Turtles. Back at the Lair, Donatello is unsuccessful at finding Usagi Yojimbo’s dimension on his Pan-Dimensional Portal – he needs Usagi’s help. The Turtles don their disguises and venture out of the sewers — along the way, they encounter Usagi who reluctantly attacks the Turtles. Needless to say, the Turtles are very confused. Usagi retreats to a shopping mall and the Turtles give chase, believing that Usagi is being forced to attack the Turtles. After they subdue him, they head for the Far East Society in an effort to talk with Obento about Usagi’s strange behavior. Meanwhile, at an abondoned warehouse where Obento is bound and gagged, Shredder sends Rocksteady and Bebop out on a mission to steal every source of “fuel” to power the Technodrome. They happen to overhear April’s live report of a new “Super Charger” additive created by Dr. Winterbottom — one drop added to a gallon of gas will fly a jet from the City to Paris. At the Far East Animal Society, the Turtles discover the aftermath of a humongous battle and the magnet that Shredder used to trick Usagi. Suddenly, Usagi bursts through the front doors and once again challenges the Turtles. After crossing swords, Usagi admits his “obligation” and learns of the Shredder’s trick. Usagi is no longer honor bound — he now teams up with the Turtles and together they hunt down the Shredder. And while the Shredder is trying to figure out which beaker (of all the beakers stolen from Dr. Winterbottom) contains the “Super Charger,” Usagi returns with his Turtle “prisoners”. True to form, The Shredder reneges on his deal. When Shredder is about to blow away Usagi, the Turtles come to his rescue with the aid of some fireworks — it seems that the abandoned warehouse was really a Chinese fireworks factory. Once again, Shredder and company beat feet in defeat.